Abu Dhabi MAR takes over Nobiskrug – Superyachts News, Luxury Yachts, Charter & Yachts for Sale. A major yacht builder of gulf, Abu Dhabi MAR recently announced its acquisition of the Germany based shipyard Nobiskrug. Nobiskrug is no small thing, with its 100 million euros turnover it has already made its mark to be in the list of finest shipyards in the world. 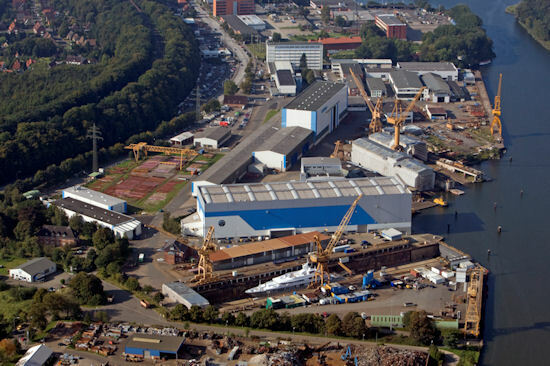 It was founded in 1905, and since then it has launched 700 vessels.The shipyard currently has 420 employees and is spread over an area of about 173,000 m2 including 44,000 m2 under cover. Nobiskrug also has dry docking facilities of 151- and 193-meter lengths. The shipyard was recently in news for its award winning super yacht Siren, which was designed by Newcruise Yacht Projects. The shipyard has currently 5 yachts under construction. But the most spectacular has been the yacht builder Abu Dhabi MAR, which was founded just 2 years ago and has a come a long way since then. Having a common ownership with the CMN Shipyard in Cherbourg, France, which is noted for its expertise in building military and commercial vessels, it has built its reputation in a considerable less time. It presently has 4 yachts under construction, of which, Swift141 and Swift135 are conversion of Dutch-built navy frigates, 462 and 442 feet in length respectively. Swift141, designed by Pierrejean Design Studio of Paris, is scheduled to be launched this year end. The CMN shipyard of France was established in 1960 and has many award winning projects in its bag. One such highly-praised project has been its “Line 60” (197-foot) yachts designed in collaboration with Andrew Winch. It was also in news this year for the launch of its two yachts, Slipstream and Cloud 9, and the third one under construction. Statistics says that there are around 75 yachts 60 meters or longer around the world, and the 10 current builds among Nobiskrug, CMN, and Abu Dhabi MAR, represent a significant portion of the global order book.